... but first, a word about truth. These quotations appear to me to be genuine Dubyaisms. I could be wrong, but they look good. (Don't believe everything you think.) There is also an exhaustive list of Quayleisms (quotes from Dan Quayle) that has in recent months been recycled as supposed Dubyaisms (with dates moved up by seven years -- something not done accidentally or mistakenly). For what it's worth, however dense Dubya is, he's not as stupid as Quayle. I got such lists mixed in with my daily spam on two occasions and recognized them for what they were -- a big lie. It really pissed me off. We have enough problems with lying politicians without lying about them ourselves. I may put up a list of actual Quayleisms. If so there will be a link here. "It is not Reaganesque to support a tax plan that is Clinton in nature." "I don't have to accept their tenants. I was trying to convince those college students to accept my tenants. And I reject any labeling me because I happened to go to the university." "I understand small business growth. I was one." "The senator has got to understand if he's going to have -- he can't have it both ways. He can't take the high horse and then claim the low road." "Really proud of it. A great campaign. thousands of South Carolinians that worked on my behalf. And I'm very gracious and humbled." cartoons and still staying on message to win?" "I thought how proud I am to be standing up beside my dad. Never did it occur to me that he would become the gist for cartoonists." "If you're sick and tired of the politics of cynicism and polls and principles, come and join this campaign." "How do you know if you don't measure if you have a system that simply suckles kids through?" subscribed to some -- some doctrine gets subscribed to me." I pontificate less, although it may be hard to tell it from this show. And I'm more interacting with people." I think we should knock down the tollbooth." "The most important job is not to be governor, or first lady in my case." "This is Preservation Month. I appreciate preservation. It's what you do when you run for president. You gotta preserve." -- George Dubya "Shrub" Bush, Speaking during "Perseverance Month"
at Fairgrounds Elementary School in Nashua, N.H.
"I know how hard it is for you to put food on your family." quotas they basically delineate based upon whatever. However they delineate, quotas, I think vulcanize society. saying, their relative positions, but that's my position." who they were," he said. "It was us vs. them, and it was clear who them was. Today, we are not so sure who the they are, but we know they're there." great privilege and who will not stain the house." "This is still a dangerous world. It's a world of madmen and uncertainty and potential mential losses." "We must all hear the universal call to like your neighbor just like you like to be liked yourself." "Gov. 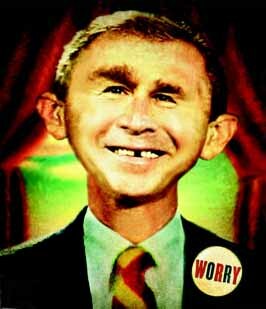 Bush will not stand for the subsidation of failure." "There needs to be debates, like we're going through. There needs to be town-hall meetings. There needs to be travel. This is a huge country." ... And, you know, hopefully, condoms will work, but it hasn't worked." "The students at Yale came from all different backgrounds and all parts of the country. Within months, I knew many of them." his party's nomination to start speculating about vice presidents." "I don't remember debates. I don't think we spent a lot of time debating it. Maybe we did, but I don't remember." from your foreign minister, who came to Texas." as quoted by Knight Ridder News Service, June 22, 1999. Bush's meeting was with Janez Drnovsek, the prime minister of Slovenia. "If the East Timorians decide to revolt, I'm sure I'll have a statement." "Keep good relations with the Grecians." "Kosovians can move back in." "It was just inebriating what Midland was all about then."